In the most recent 007 thriller Skyfall, James Bond was beset by mommy issues as a metaphoric brother played by Javier Bardem tried to destroy M, his metaphoric mother, because she always loved Bond best. Now in Spectre, the new 007 thriller, Bond is beset by daddy issues. You see, Bond’s father died in a skiing accident. His “adoptive father” and “brother” died two years later in an avalanche (lesson here? 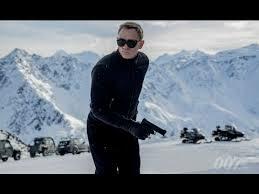 don’t go to a winter resort with 007). And his present day metaphoric father, the new M, has to disown him at one point. However, Blofied, Bond’s new enemy, who is actually his old enemy (but you’ll need to see the movie for that), is actually that “brother” who isn’t actually dead, and who killed his own father and is now trying to take over the world because, well, daddy always liked Bond best. Somehow it’s funnier when the Smothers Brothers perform this routine. Spectre is not the worst of the Daniel Craig Bond films. For those keeping score, it’s better than Quantum of Solace, but not nearly as good as Skyfall. Though the movie as a whole is solid enough, as directed by Sam Mendes (a long, long, long way from American Beauty, Revolutionary Road and Road to Perdition—are we ever to see their like again) and written by committee (so it’s bland as a bill put up for vote in Congress), it’s also a bit lethargic (which is probably the last thing you want a Bond film to be), with perfunctory chase scenes that aren’t that exciting or, worse, aren’t that clever and locations that don’t come close to the delirious sets used for the last Bond outing (for some reason, a huge amount of the action takes place on a train casually choo-chooing its way through a desert). The basic premise is a good one. A bad guy wants to gain control over the government computers of a number of major countries. An English bureaucrat, the bad guy’s puppet, tries to get these countries to share their IT under his oversight, all on the pretext of fighting terrorism. All very topical to be sure. But it probably doesn’t help that the devastation Spectre wrecks always manages to happen off screen, such as an attack in South Africa that is caused in order to convince that government to join up with the others under an umbrella operation headed by the veddy British C, who is taking over MI5 from M. Spectre, itself, always feels more of a threat in theory that in actuality. It’s all a bit too cerebral. It begins in Mexico with a Day of the Dead parade that is filmed with a very impressive tracking shot that unfortunately ends too soon to be as impressive as it probably should be. And it doesn’t have the delightful payoff it so promised it was going to have. Bond is also not that likeable a fellow here. When he returns to London, he treats everyone with contempt and a sneer, shaken not stirred, which is rather off putting. Like the action scenes, the plot is a bit of a plodder as well. It has difficulty cranking up any edge of your seat tension. And there are no surprises, at least I hope that C turning out to be a puppet of Blofield didn’t take anyone aback. It was just so incredibly obvious, you were hoping the screenplay was bluffing (note to the producers—if your intent was to fool everyone, the last person you should cast in the role is Professor Moriarty). 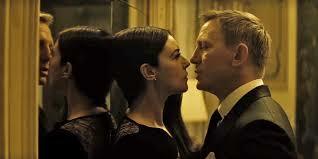 At the same time, there is some nice wit here and there in the dialog, especially in a scene with the newly widowed wife of an assassin (Monica Bellucci with her Sophia Loren body and puffy, pouting lips) who asks Bond, Can’t you tell I’m in mourning, and Bond responds, quite appropriately, No. 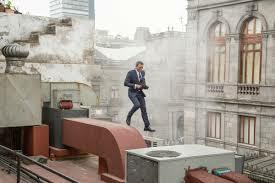 And Daniel Craig, once he gets over his sneering façade, has a nice rapport with all the actors. Everyone effortlessly plays their parts as if donning their oldest and favorite sweater. 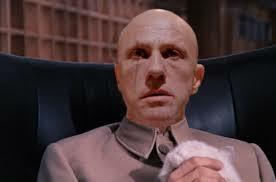 The villain de jour is, as was said, Blofeld. So here we also have an origin story as to how the evil genius became Bond’s biggest enemy (that daddy thingy), as well as how he got his scar, his cat, and a variation on his patented line, And here I thought you came here to die. Christoph Waltz plays the desperado and does as good a job as the part allows him to. There is an ongoing conflict between C and M as to whether the future is computer intelligence or the more down to earth, one on one, method of Bond. I’m sure you know who stands for what. But to be honest, M’s arguments were pretty much as lethargic as the plot. Because C is right: You can fight Blofeld and even defeat him, but you can’t fight the future. With Ralph Fiennes as M; Ben Whishaw having a good year as Q (he’s also one of the best things in Suffragette); Naomie Harris as Moneypenny; Andrew Scott as C; Rory Kinnear as Tanner; and Lea Seydoux (Blue is the Warmest Color) as the Bond girl de jour, looking very attractive in doctor’s coat and glasses. Also with Dave Bautista as an Oddjob type thug with fingernails on his thumbs sharp enough to dig someone’s eyes out. He’s big and scary, but as seems on par with the rest of the movie, they don’t give him the ironic ending Oddjob gets.